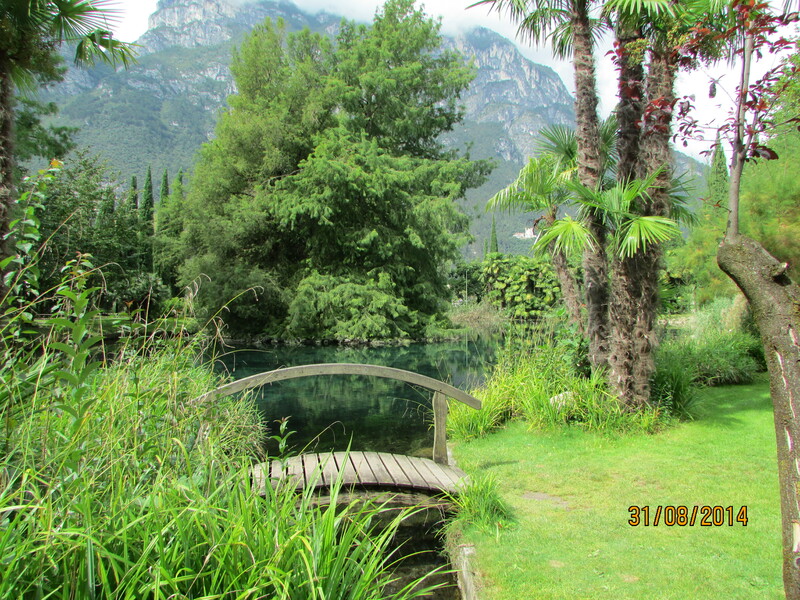 Wednesday: We arrived at Hotel du Lac du Parc, booked through Citalia. 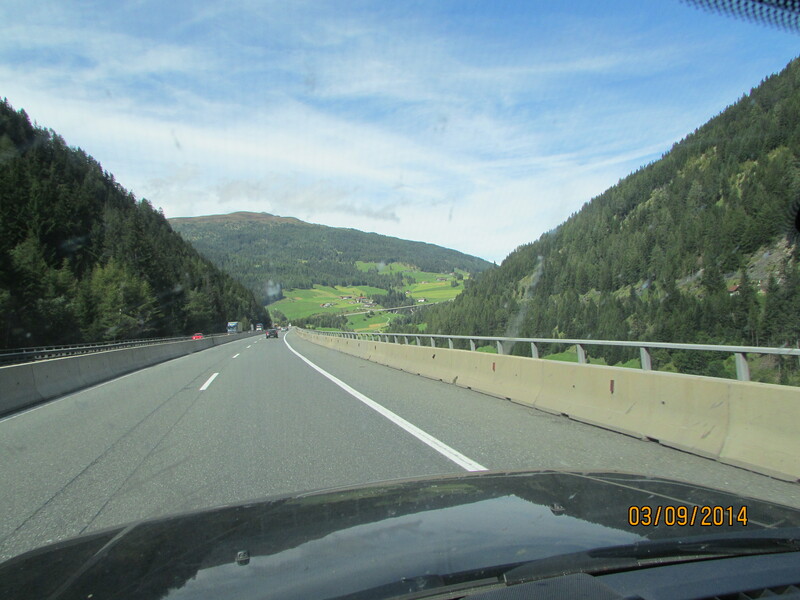 I had recently had surgery, so David and I drove there via France, Luxembourg, Germany and Austria. It was a lovely drive, really interesting and the traffic was okay. There are also two swimming pools, one which seems more suited to young families. Both have plenty of sun loungers next to them and a nice mix of shade and sun. We liked the one next to the bar, where you could buy drinks and ice creams and take them back to the loungers. I was feeling ill so had dinner in my room. The family ate in the hotel restaurant then played cards in the bar. Bathroom light seems to be permanently on, which is a little odd. Thursday: All had breakfast on the terrace. Nasty coffee and juice from a machine. Then realised that other people were ordering drinks from the waiters. We copied and then had very nice coffee and fresh juice. Mark said he did not want to see the opera in Verona, which we have already bought tickets for. David said that was fine, but he had to then pay the €120 for the ticket. I decided not to join discussion. There are dogs here which is nice. Someone has allowed their dog to wee in the lift, which is not nice. Went to pizza place opposite hotel for lunch. 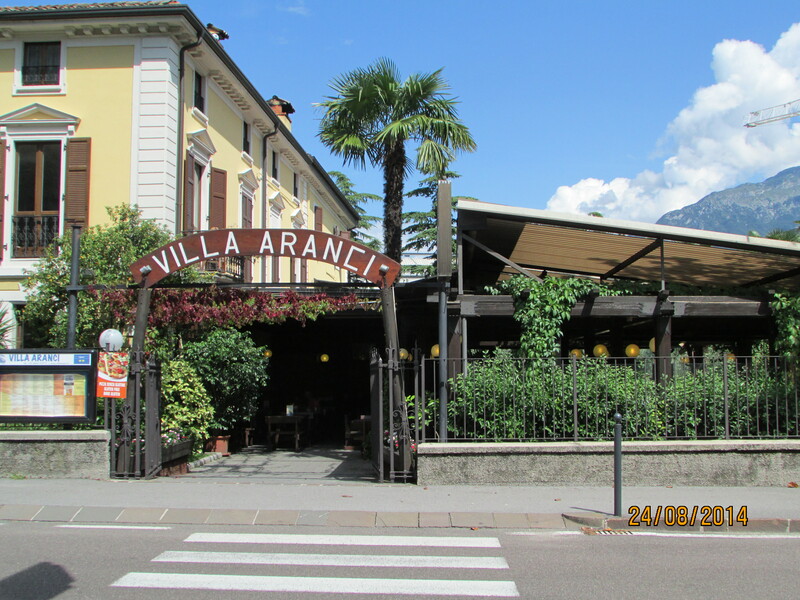 Villa Aranci. Very nice, rustic setting, not too expensive Boys had tankards of beer, I had some nice wine. Becky sunbathed. Boys then played “How near to Rebecca can we throw the ball and not hit her.” They do not improve with age. Nice dinner in restaurant. Family went to watch a jazz concert in town, I went to bed. Friday: Pouring with rain, which was disappointing. Relaxed day doing very little. Nice dinner then had hot chocolate in the bar and played games. Everyone discussed the bathroom lights, which are always on in all our rooms. Family went to hotel gym or read/slept. Went to Co-op near hotel and bought food for lunch. 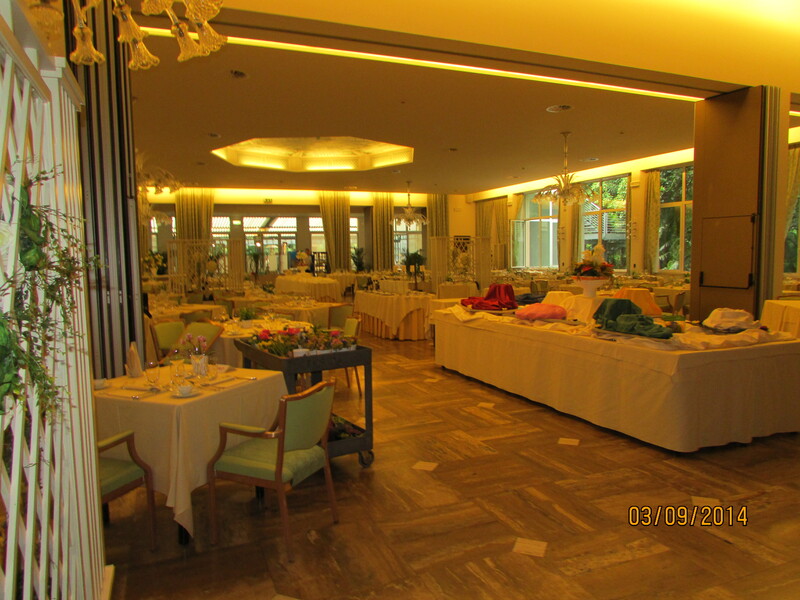 Ate on balcony (each room has a balcony overlooking the garden.) Mark chose beer, nutella and crisps. Great diet…. Family played Catan then swam. 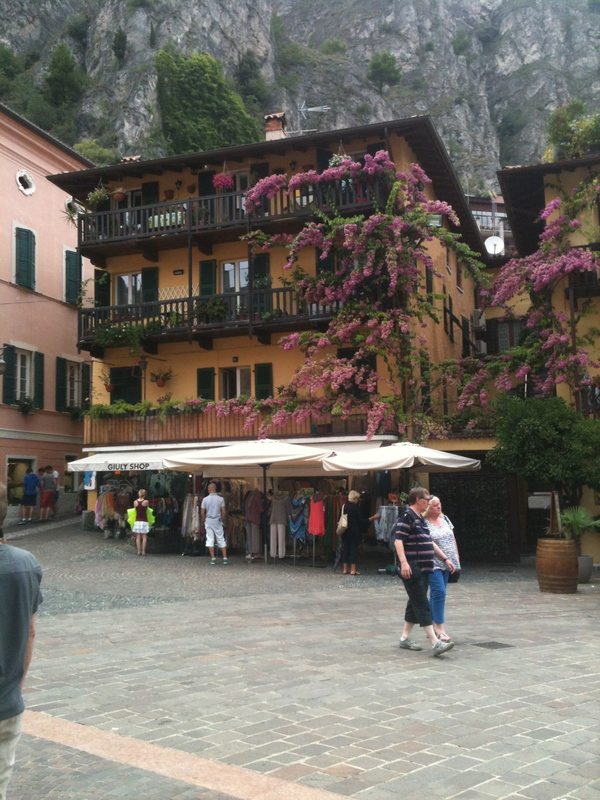 I walked into town with Nina (Riva del Garda, a five minute walk from the hotel. )Saw a band. Breakfast, then family swam. An Austrian boy joined them at the pool. Walked into town and looked around. Some nice shops selling touristy things. Pizza in restaurant next to lake. Bottled water which arrived open and tasted of ‘tap’. I slept, family went to pool and played volley ball. Were joined by a group of Germans. Mark said he managed to use all three of the German words he knows. One is a swear word. Super. Found a switch under the mirror in the bathroom. This operates the bathroom light. Informed family. Nice dinner. The restaurant staff are really friendly. They have noticed that James eats the most, so always give him a huge portion. Gave up on pool when it started to rain. 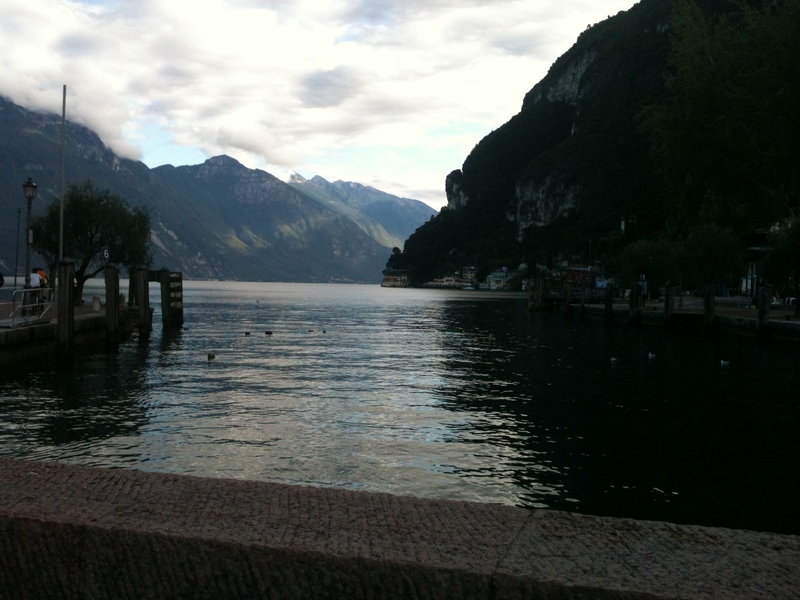 Walked into town (5 minutes) and got a ferry to Limone. It was very windy on the ferry, wished I had worn something warmer. 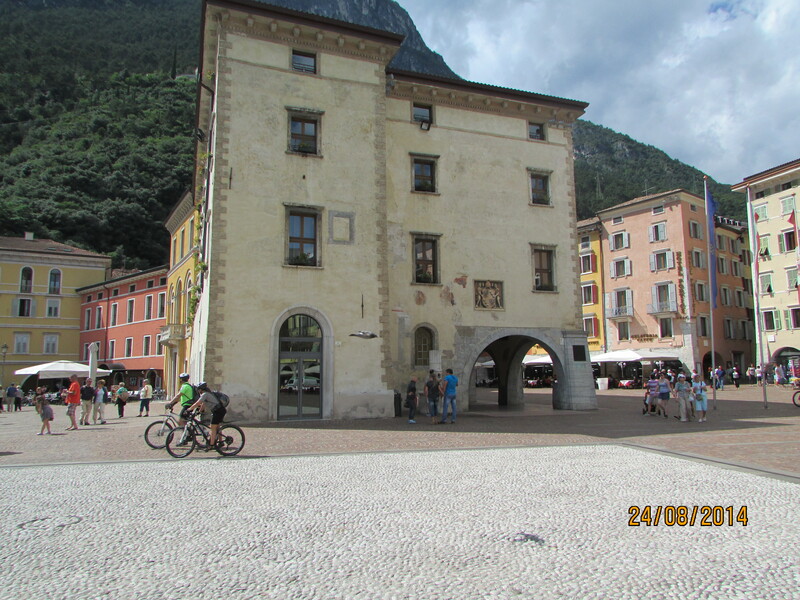 Limone was a pretty town. Had some nice little shops for buying trinkets. Had coffee and ice creams, then got the ferry back. James told us that going to reception to say that you have lost your key card for the fourth time is embarrassing. Tuesday: Rebecca did the ‘ice bucket challenge’. The concierge (male) seemed delighted to throw a bucket of iced water over her. 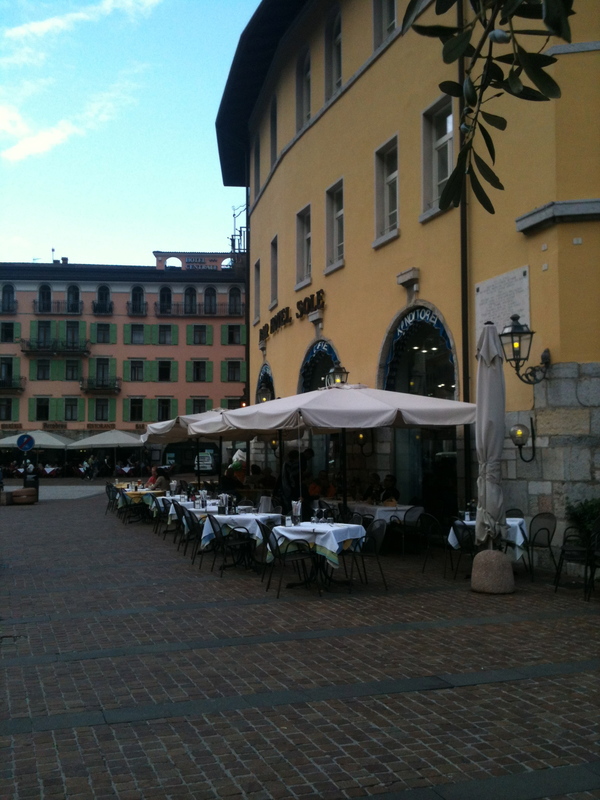 Stayed at Romeo and Guilietta hotel (booked through Citalia). We had been told that parking was provided. They showed us on a map where we would probably find a parking space (which is not what we were expecting) and gave us a permit. I was ill, so slept in room. Family walked around the city and had ice creams. I was ill so stayed in room. 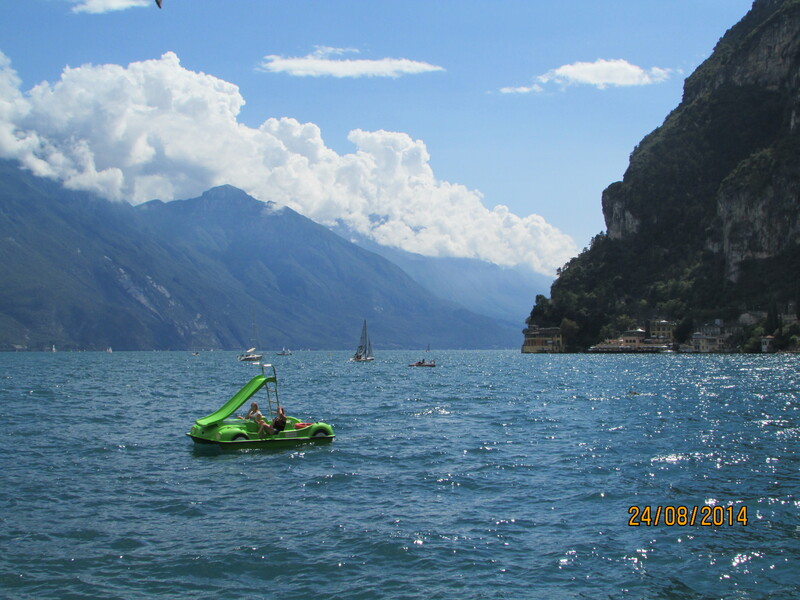 David, Nina and James took big inflatables to the lake and floated around on the waves. I was too ill to go into dinner. The staff were very accommodating and let David order from the restaurant menu and then bring it to me on a tray. So much nicer than having to pay for room service. They also started to ask if David had murdered me, as they had not seen me for some time! During the meal, the room started to shake. I texted to ask if we were having an earthquake.The family all rushed upstairs thinking I was having a funny turn! They assured me I was imagining things, should stay in bed and went back to finish their meal. Thursday: Another sunny day so family relaxed at pool. Saturday: I finally felt well enough to go into dinner. It was fun but clearly the family had become rather out of control in my absence: Mark received a menu with additional comments, such as, “okay but sauce no good” scribbled next to each dish. The head waiter was adding his own recommendations! David produced a list of Italian phrases copied from google translate, which he proceeded to read while the waiter waved his arms in exasperation. James confided that he has now lost his room key six times, so has ‘borrowed’ the cleaner’s one. Sunday: Mark has been to keen to try the little “make your own tart” things at the buffet breakfast. Unfortunately, the pastry case (which in fairness, does look remarkably like a small ice cream cone) turned out to be cardboard. It is for collecting jam in, not eating. He realised on his first bite. Breakfasts were nice. There was an extensive buffet and in one corner was the ‘egg lady’ where you could line up and ask her to cook eggs, omelets or pancakes. David and Mark, James and Nina decided to take two man canoes out onto the lake. There was a cabin in the hotel garden where you could hire canoes and life jackets. They went out and I took photos. Rebecca then switched places with Nina and the two boys went together. They managed to tip up and lost James’ tee shirt, which he had been using as a back rest. Also, at some point, each male decided to stand up. Individually. For no reason. Why would you feel the need to stand up on a canoe? It is like climbing towers and throwing socks in random places: one more thing about men that I cannot understand even a little bit. Monday: During breakfast, James’ room key fell out of his pocket. (I have lost count now.) A nice lady pointed it out. The family drove up into the mountains around Garda. They said it was cold! They took some great photos of the views. Mark locked one of James’ shoes in the safe. He then lost the code. The only option was to ask the security man to come and open the safe. There was some discussion as to who should do this. I have absolutely no idea how they explained that it contained only a flip flop. At dinner time, there is a miniature orchid on each table. Very pretty. Nina caused ours to have a slight mishap. May try and switch it. Or glue it? We left for our long drive home. 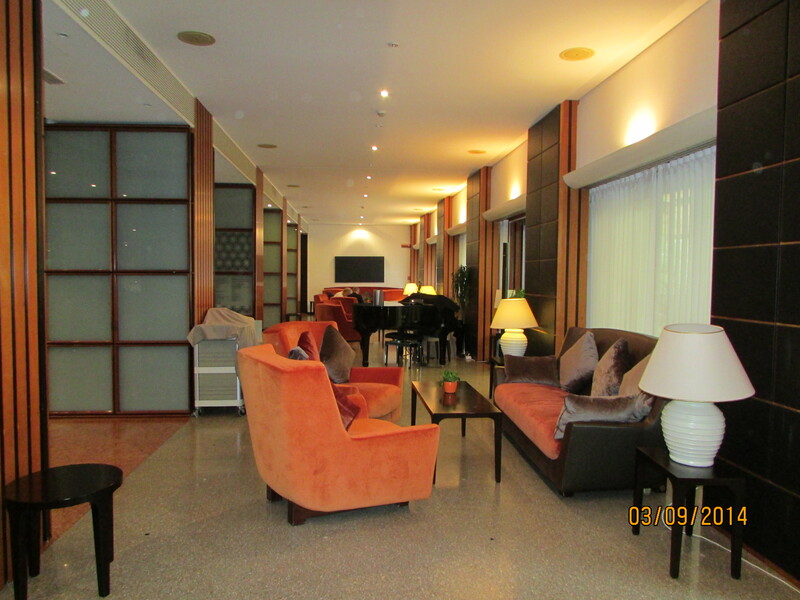 This was such a lovely hotel, with friendly staff. Even being ill here was nice because they had such a relaxed manner. It was clean and pretty with lovely meals and lots of activities, most of which we didn’t manage to try. I definitely hope to stay here again. Next time I will hire bikes, and get the ferry to all the little towns around the lake and maybe walk up a mountain or two. 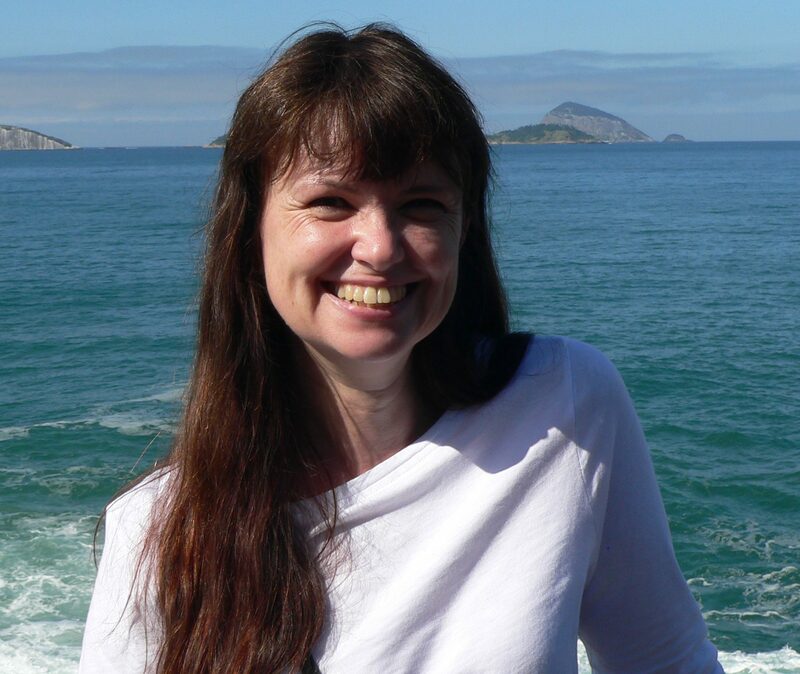 Will also be ideal if I ever decide to bring my ducks on holiday….